Corona, sometimes referred to as the heart of Southern California, represents an area of tremendous growth and cultural richness between Orange Country and the Inland Empire. Over the past two decades, as Orange County became increasingly more populated and developed, families and firms moved to Corona, making it a prosperous city. With a median income of $72,162, Corona now surpasses Orange County ($70,232) and out ranks six of its eight largest cities. This prosperity has flowed into Corona educational institutions yielding primary and secondary schools that achieve well above California's Academic Performance Index. The City's industrial market has shown continued strength with a low 4.8% vacancy rate. Also, the City's crime rate remains one of the State's lowest. Corona represents one of the most best places to live in Southern California and it just keep getting better. 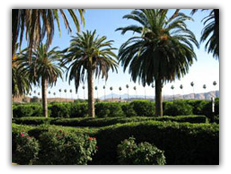 • Located on the State Route 91 between Orange County and the Inland Empire. • Low cost of living coupled with a strong education system, strong workforce and upscale amenities make Corona the ideal home for many upper-middle class people starting families. • Corona is home to several leading companies in Aeronautics, Aftermarket Auto, Food Processing, and Research for Medical Technology. Founded in 1886, Corona's downtown had served as home to several international racing events at the turn of the century. Now, the Corona's Downtown will be undergoing rapid development. The vision for the Downtown District includes vertical residential mixed-use, retail, residential, office, restaurant and medical uses. This type of development encourages multiple uses and makes the most of scarce land to provide residents access to goods, services and recreational opportunities. With retail and entertainment epicenters like the Promenade Shops at Dos Lagos and the Corona Crossings. Corona has plenty to do in the spur of the moment. After a long work week, many residents seek relaxation from the world renowned Glen Ivy Hot Springs day spa. Others venture to near by state and federal land for hiking, mountain biking, camping or sight seeing. Less than an hour to most of Southern California's hottest beaches such as Laguna Beach, Huntington Beach, Santa Monica, and more. As of October 23rd, 2009, the Los Angeles NFL stadium has been approved for development in near-by Walnut. Less than 35 minutes from Corona, on State Route 71, the new stadium will be home to Los Angels's new National Football Team.